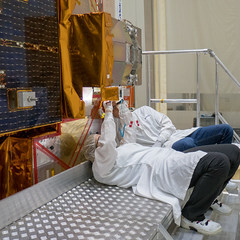 15 November 2013 The pictures below show how the Swarm satellite assembly was lifted, positioned and joined to the Rockot Breeze upper stage of the launcher. All this took place yesterday. The next step will be to fix the rocket fairing around the satellites to protect them during launch.